Inconvenient: Giant Coral Reef That ‘Died’ In 2003 Teeming With Life Again | Watts Up With That? From the “global warming and ocean acidification will kill everything, forever” and the “nature always finds a way” department comes this inconvenient truth. August 18, 2016 in Oceans. I’m proud to not add anything too sarcastic, though it takes a lot of mental power not to. Of course the corals are not killed permanently by a weather event. They do spores, ffs. It was ever thus. After Saddam set light to the oil wells and the gulf was polluted it was said that it would never recover. 18 months later all was back again. Coral bleaching is a normal process. Corals have survived and thrived in water much warmer than now. Indeed, most of their time on earth, the oceans have been a lot hotter than now. And that is a long time. Class Anthozoa probably dates to 570 million years ago, during the Ediacaran Period of the Precambrian. Definite fossil evidence exists from the Cambrian Period, first of the Paleozoic Era, about 540 Ma. Modern corals arose during the Triassic Period, first of the Mesozoic Era, some 230 Ma. They thrived during the Cretaceous Period, third and last of the Mesozoic, when ocean temperatures reached hot tub levels. Erosion has revealed massive Silurian reefs in Indiana and other adjacent states, remnants of shallow seas that covered the area. I haven’t been able to find data on the teperatures of these seas, but I imagine they were nice and warm. These reefs and seabeds have been mined for limestone for well over 100 years. You’d think that alarmist climate scientists would be equally happy to be proven wrong. They prophesy doom, revel in the smallest of signs that they are correct, and attack viciously anyone who shows that everything is going to be OK. The science in climate science has left the building. Only the politics remain. Yes, but the quote was from Dr. Mumby. Jane Palmer was just the byline on the BBC story. How does one define “death” in a colonial organism? Each coral polyp is by one definition a separate beastie, by others only a part of a larger congerie. Apparently, someone was using the wrong definition of death. Don’t give the warmistas any ideas, they will start to talk about coral genocide. Have fun storming the coral castles boys. It wasn’t a heat wave. It was the 1998 El Nino. And that the reef thrived during the equally big 2015 El Nino shows what Jim Steele posted. Reef was repopulated with coral polyps and their symbionts better adapted to the local environment. Is “unbleach” a word? I know “wrong” is and so is “cycle.”. lol, You can’t hardly keep life out of any part of the planet, just try keeping grass out of any area as an example. They’ve found rad-resistant bacteria growing inside the Chernobyl reactor. It is refreshing the encounter a climate alarmist who is willing to admit errors. Most of them — indeed, most people, in general — have no use for evidence, once they’ve made up their minds. They cling to their errors as if their lives depended on their infallibility. That simple statement encompasses perhaps the most important observation of human behavior. That is, our decisions are made not only from knowledge, but from belief, (or doubt.) Once a belief is established in our minds, it is difficult to eradicate, even with overwhelming proof to the contrary. Knowledge is pointless if it does not result in belief of some kind. . right? Belief means one is convinced, and it naturally occurs as one acquires knowledge, it seems to me. The notion that there is a separation or distinct difference between knowledge and belief is merely the result of indoctrination to that effect, as far as I can tell. We little ones have beliefs, but the big important ones have knowledge, goes the con . .
For me, knowledge is certainty which encompasses an immutable core of truth, gained through experience. Unless I know the truth of something, then I only understand that truth from a state of belief. Belief and doubt are also forms of certainty for an individual, but exist, for the believer, only within bounds of the believer’s perception of that truth. Their belief may be completely, or subtly wrong as far as the immutable core of truth of that particular bit of knowledge is concerned. As example, I am looking at a particular and unique object. I have actual knowledge of this object and could describe it to you, even to the point where you could visualize it in your mind, but until you examined it for yourself, you could only believe, or disbelieve what I had told you about it. Likewise, I could describe a wonderful Oriental food item to you, but unless you had eaten it also, you could only believe that you knew what it was like. There has been at least one mention in these pages of studies pertaining to the phenomenon that it often becomes difficult to correct a mistaken belief, after an individual has accepted that belief as truth. Humans seem to be afflicted with a need to be right. One need not look far to find examples of how this phenomenon is used by the unscrupulous in their dealings with others, at all levels and attributes of human interaction. This website is a stronghold for those who would gain knowledge by differentiating the immutable truth from the disparate currents of belief and purposeful deviations from truth which are cast into this sea of mind in which we all exist. So too for one and all, I say. Belief merely means being convinced. I’m not arguing that all beliefs (or knowledge) are equally valid or well grounded or whatever, but that the idea of belief as a separate or distinct aspect of knowing in general, which is somehow detached from the person’s experience, education, observations, etc, is the stuff of propagandists. It allows the one successfully convinced of this “lesser knowing” state, to dismiss and/or belittle those who say they believe this or that . . which is to say (perhaps anyway) that they realize their belief is not absolute truth or the like. I get that, but we don’t actually have that form of relatedness to complex things, which we usually mean when we say we believe something. You can’t see historical events, for instance, and so are bound to gather various information and asses what is seen directly . . I have never carefully tested the rate at which things fall in a vacuum . . but I believe others have and accept (believe) there is a constant rate which has been measured carefully. I might say I know the rate, but in truth it is a belief, and even if I did measure it carefully, I cannot actually know, in the direct observation sense, that it will be the same the next time I measure . . I believe it will be, though, for what I believe are very good reasons . . Brings back fond memories of Emily Litella. It says 2015. +1 for what Rud says about the new colonizers being better adapted than their predecessors . It’s not evolution in the sense of new things coming into existence, just change in a given location’s population(s) due to natural selection of the varieties that are best suited to the given environment. Much confusion about this has been instigated it seems to me, by fervent Evolutionists who wish us to think any changes and all variety within living things are testament to their “religion’s” validity. Maybe they should rename the reef “Lazarus”. Worldwide, the Elephant in the room continues to be totally ignored. Well Jane (aka Virginia), yes there was a heat source but it twern’t the air. Tell you what Virginia, stand near your tub in a typically lukewarm bathroom and see if your longwave infrared body heat can warm up that lukewarm tub water enough to enjoy a soak. On the other hand, you could fill the tub with warmer than tepid water and let IT heat up the tepid air. 100 years to recover? Sheesh it took way less time than that for corals to recover from a nuke!! Just need to add “All” in front of that now. Sorry, but I doubt their sincerity. Just so long as the “science” behind their “projections” remains intact, they can afford to be magnanimous. Oh! Noes! Its BETTER then they thought!!!! Cognitive Dissonance to the MAX! Credit to Dr. Peter Mumby who reached the stage of “acceptance and hope” so quickly. Someone interrupted me while i was counting on my fingers and i lost my place. So, is the science still settled? It’s settled that the coral doomsayers were wrong. The NYT headline says it all; keyword there is “Protected Area” implying we saved it! I couldn’t bring myself to actually read the story,. How much impact caribbean lobsters bleach fishing have on coral reefs? Bleach fishing for lobster? I’ll have to look that one up. I love to fish but I’m more of a rod and reel type of fisherman. In 1998, a heatwave, which raised ocean temperatures, had caused corals worldwide to go a deathly white – a process called bleaching – and die. In 1998, a strong El Nino, a natural increase in ocean temperatures, influenced a heatwave and caused corals worldwide to go a deathly white – a process called bleaching – and die. OK sorry, my way doesn’t sound frightening enough and can’t be blamed on Man…Where is my head?? Bryan please. We don’t ask these questions on public forums. The more likely explanation resides in confirmation bias leading to an inadequate sample size during the original survey. It’s not difficult to find a thriving reef, when it hadn’t died in the first place. Idol of the Tribe mates. That says it all. Imagine them saying that after spending trillions of tax payers’ dollars on this nonsense. Imagine what they will say about the millions dead when we fall unprepared into the next ice age. Well, we can all be glad that the corals came back. I’m pretty sure about everyone on this site would have predicted that. I certainly would have. That makes our predictions in this area better than the so-called expert biologists by about 100%. Let’s be generous and say-97%? Next question! After the fiasco with reporting on the GBR bleaching, I wonder about the veracity of the stated bleaching event from 1998 as being 16% worldwide. 16% of reefs? Or 16% of tropical reefs? Or 16% by area? As facts go, we know at this point that much of the reporting on anything to do with climate change is casual or more often deliberate b.s. But of course they know that disproving something on page 8 years later does nothing to detract from the outrageous headlines on page1! Yes, unless you’re someone like Michael Mann whose reputation and ego is more important than science. Anyone who refuses to provide their research data to others because they might find something wrong with it doesn’t deserve to be called a scientist. And all this time I thought they were telling us CO2 caused acidification. Nice catch. I overlooked that. Does it make any sense at all? Does warmer water temperature somehow reduce pH? Possibly explained by the lower solubility of gases in warmer water? This should be a plaque, awarded annually by WUWT. Whoever proofread the above article presumably changed every occurrence of “disappointed” with “thrilled”. They were disappointed (“thrilled”) to find their poster child devastated coral reefs to be teeming with skeptical fishes, oil industry shill corals and denier crabs and lobsters. These people are ghouls. They feed on fantasies of death. Life to them is like sunlight to a vampire or salt to a slug. As Charles Darwin pointed out, coral atols are CAUSED by rising sea levels. Those who forget their history of the Battle of the Coral Sea are doomed to repeat it although where Kaiser Bill fits into the big picture I have no idea. But those of us who studied and remember history are doomed to be drug through the same muck because everyone else is determined to drag the world through the same $%^#*&$ mistakes! Kaiser Bill fits in neatly and nicely. His empire included South Sea colonies close to or even on the Coral Sea, if the Solomon Sea be a part thereof. Most of these clowns know nothing about Corals. Anyone who’s lived and worked with them every day for decades knows the whole thing is complete bunk. No one in my area of interest, reef building\keeping that I know of, believes OA is even possible, let along the warming doom to corals. I said it before I’ll say it again, with suddenish changes sps corals that get frequent cool upwelling waters will bleach. If there is change in light spectrum, even UV, they will bleach. If nutrients run a little low, they will bleach, there is about 6 or 7 other causes of bleaching too, that are natural, including infections. I have yet to meet a marine biologist (who is not a reef hobbyist also) who knows anything credible about Corals and how they actually interact with their environment. There is no substitute for closely monitoring and caring for corals for years on end in closed systems that require much attention to details, as any negative change becomes apparent rapidly and corals suffer. 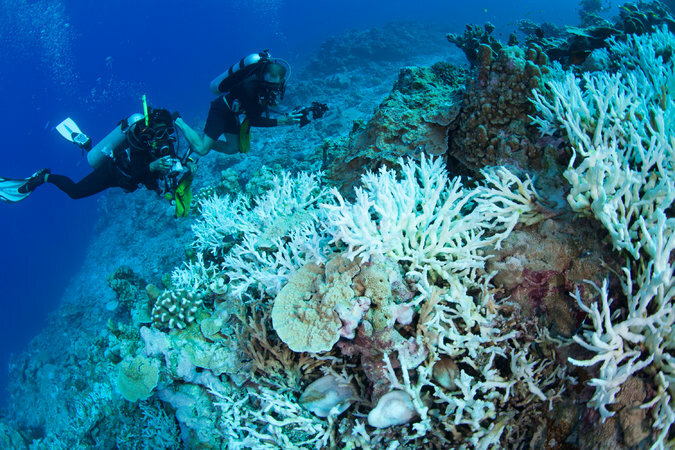 “The single bleaching event of 1998 killed nearly 16% of the world’s corals.”……really!?!? Largest coral on the planet discovered in murky Amazon discharge……Coral discovered in very cold North Atlantic off of coast of GB. What about dinosaurs? Nope! Climate change, and they are serial too! What if corals rely on the periodic El Nino warm waters and bleaching events to rejuvenate? Just as forests rely on fires. Remember that high energy gas cloud NASA said our system had entered? Remember how strangely the planets were noticed to be significantly more energized ? Remember how the Moon has oddly gained an atmosphere? Remember how Venus’ poles are frigid? This everywhere energy cannot but fail to do exactly what it has done in distant past cycles—energize/alter/create life on Earth. What on Earth are you talking about? That’s gibberish. I am really tired of you people not shutting up and letting your betters run your lives. Lying is necessary for us to implement our totalitarian agenda. You’re just going to have to accept it and keep your mouths shut. “Our [alarmist] projections were completely wrong,” he says. What other alarmist predictions, exaggerated claims and catastrophic projections are you fed in order to push the global warming agenda?